I’m having a major love affair with oils lately. I’ve researched all of them — carrier oils, essential oils, which oils are best for which skin types and concerns. I’m like an oil master, mixing my way through an endless array of face and body concoctions. Today I want to focus on one of my favorites: the brightening (and anti-aging!) body oil. We often overlook the needs of our body, instead focusing on our complexion. But our décolletage, neck, elbows, hands, knees, and shoulders are all areas that are exposed almost daily, yet they’re not being cared for. Well, this Brightening Body Oil will not only brighten (duh) the skin, it also helps to reduce the appearance of sun spots and freckles, intensely moisturizes without causing breakouts, leaves skin soft, smooth, and gorgeously glossy, and it offers antioxidants for serious anti-aging benefits. 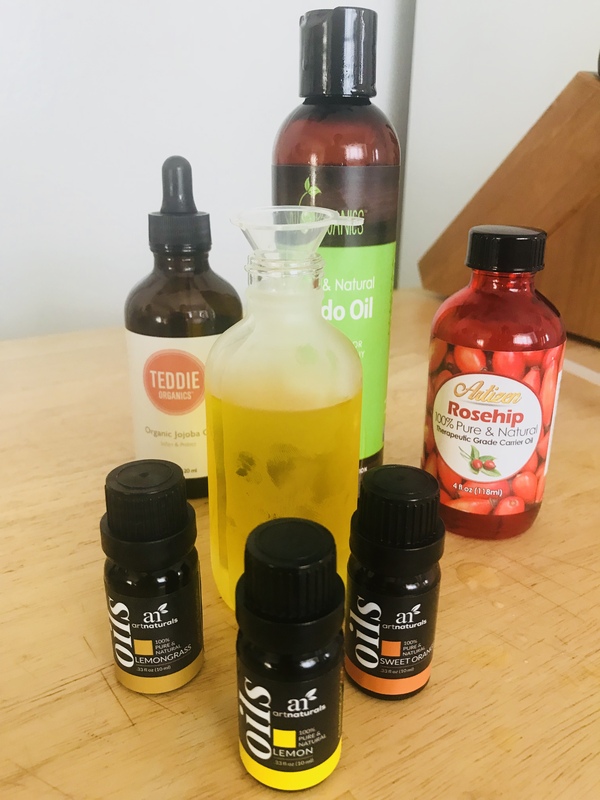 The best part: you can make it at home, in 5 minutes, for about $10 total with tons of oil to spare, so make a new batch every week and bathe your limbs in beneficial oils that don’t only give good beauty benefits, but they give good scent, too. All-natural, of course. 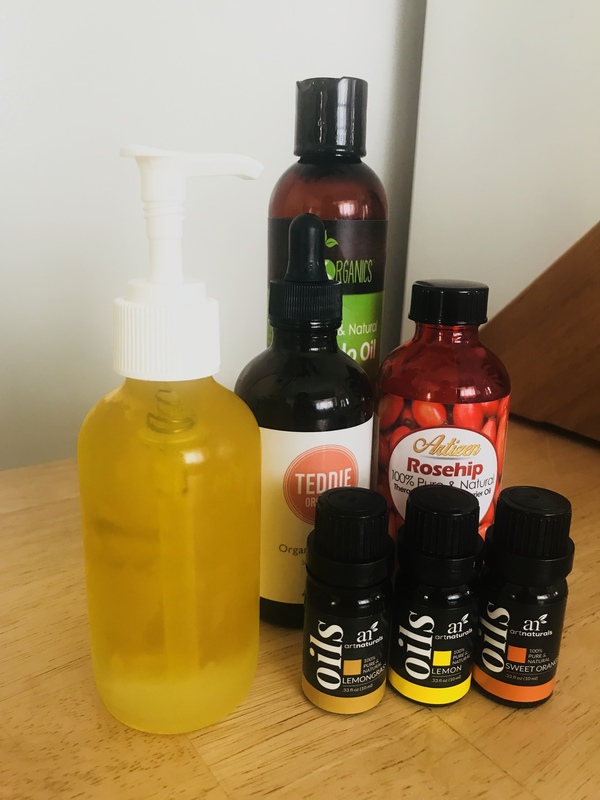 Two types of carrier oils; we suggest Jojoba Oil for oily and combination skin types and Avocado Oil and Rosehip Oil for for dry and mature skin types. Have normal skin? Use both rosehip and jojoba. Make sure all oils are cold-pressed and organic (use our links to purchase our favorites). 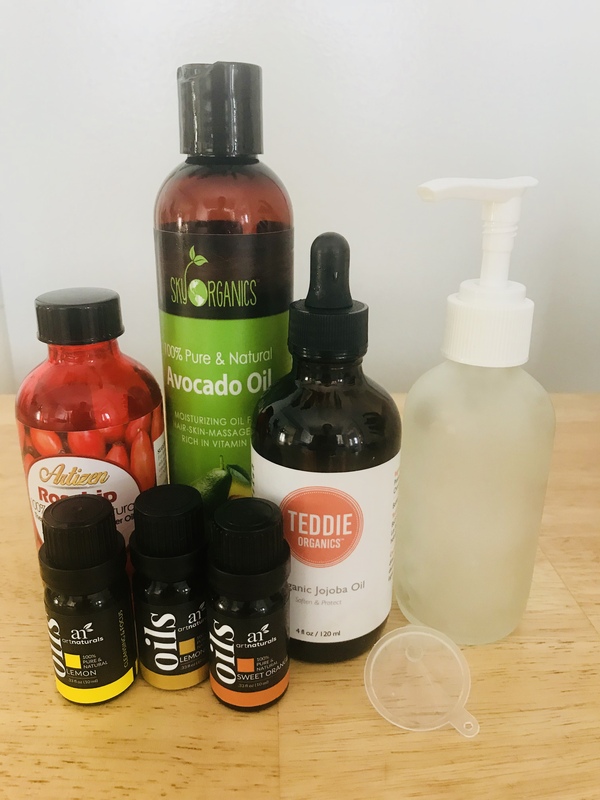 *invest in an essential oil starter kit like this, if you’re going to be making several different kinds of body and face oils. Rosehip Oil – A wonder anti-aging oil, rosehip not only moisturizes, it also offers the skin antioxidants and Vitamin A. Its a wonderful oil for evening skin tone and removing sun damage and pigmentation, while also treating wrinkles and texture. While rosehip is great for dry and normal skin, some combo skin can tolerate it (I can use it on my body), so patch-test on your chest before moving forward with your body oil. Avocado Oil – This highly hydrating oil is chock-full of monounsaturated fatty acids like oleic acid (which is bad for oily skin but great for dry and sensitive skin). While it may clog pores – it’s comedogenic rating is 3 – it’s said to be a choice carrier oil for dry skin types that are prone to acne. I don’t recommend using this for oily or combo skin types, but with the astringent qualities of the brightening essential oils, this carrier oil is ideal for our brightening body oil for dry skin. Jojoba Oil – A hydrating oil that works on all skin types without clogging pores. 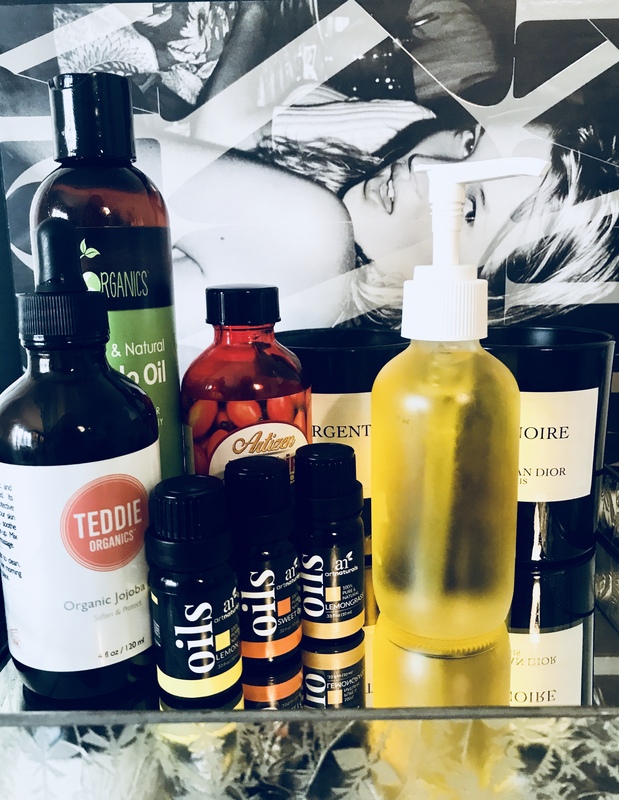 It is the oil which most closely resembles our body’s natural sebum, so its said to regulate oil for combo/oily skin types, while also moisturizing dryer skin types. Oh, and did we mention it helps with acne and wrinkles? Well, it does. Orange Essential Oil – An effective anti-aging oil that increases collagen and blood flow; also a great antiseptic for oily skin types. Lemongrass Essential Oil – A natural antiseptic and astringent; can be tolerated on all skin types; leaves skin more even, brighter, and glowing. The rule of thumb is for every 30ml (or 1 0z) of carrier oil, you add 12 drops of essential oil. This will give you a 2% dilution. If you have severely sensitive skin, I suggest only diluting to 1%, so cutting the 12 drops per 30ml to 6 drops per 30ml. Since we are making 4oz, that’s 120ml, so, technically we can use 48 drops of essential oil to give us the 2% dilution. I only used 36 drops and it felt great. But test the oil, and if your body reacts well, you can always add more essential oil into the mix. With your funnel, pour 2oz of jojoba or rosehip oil into the glass bottle, then add 18 drops of lemon oil. Next, add 1oz of avocado or jojoba oil, depending on your skin type (see above). Then another 12 drops of Lemongrass. Pour in another 1oz of avocado or jojoba oil, then top it off with 6-12 drops of orange oil. Remove the funnel, close the bottle with the pump that is provided, shake well, and you are ready to use! Bonus: this oil smells delish, like a citrus tree. *I have combination/ acne-prone skin, but since the essential oils are so antiseptic, I’m able to use half jojoba and half rosehip oil as my base/ carrier oil. Mix and match depending on what suits your body. For dry skin, I highly suggest doing half avocado and half rosehip. If you have oily skin, perhaps 3/4 jojoba, 1/4 rosehip (stay away from avocado entirely). I suggest patch-testing to make sure you don’t have any irritation before smothering on your entire body. I’m obsessed with this oil for my neck and chest as its really helped with hydration levels and diminishing pesky sun damage.